Looking To Find Out Everything Before You Buy A Business? Want To Know Exactly How To Do It? Due Diligence: The last stage in the business-buying process: "The Final Frontier". This is the time when you will have access to all of the company's books, records and files. You will have a pre-determined due diligence period in which to investigate the information to ensure that it is true and accurate. The due diligence phase is also the time when many prospective business buyers make the most expensive mistake of their lives! Every seller knows certain things that they definitely don't want you to discover. The question is: Are you going to learn their secrets before or after you buy? Due diligence is the way to discover everything before you buy. Once you close the deal it's too late! There's little or nothing that can be done about it. The consequences can be enormous. Every task that you need to do, every step that you must take, every hazard that you must avoid is outlined for you in our complete Due Diligence Study Guide. Your Investigation Must Be Flawless! There is no room for mistakes! You must conduct a due diligence investigation that is so complete that you leave no stone unturned. The only way you can determine if it's right and what the future looks like is by conducting such an exhaustive due diligence investigation that by the time you're done you'll know more about the business than the current owner does. There are eleven due diligence areas that must be checked out. Perhaps some don't apply to every business, but for most businesses, each one of these areas has to be investigated with equal vigor. In order to conduct a thorough investigation you must have everything in order before the due diligence process begins . In fact, you must start your due diligence preparation and information gathering the moment you decide that you are interested in a particular business. 2. Allow Yourself The Time You Need To Do It Right! Most sellers will try to have you agree to short financial review period; some as little as ten days. This simply does not make sense. There isn't a business in the world where you can learn what you need to know in 10 days. Unexpected problems are the last thing that sellers want to deal with at this stage. Are they hiding something? Are there secrets if they want to limit your due diligence time? If the business is as good as they say it is, wouldn't it make sense to let you take your time so that you are certain to buy? We recommend that you need a minimum of 20 working days, a full calendar month, for a complete due diligence investigation. If the seller won't agree to this, it's a clear warning sign. And, if at the end of this period you still need time then get it. You cannot move ahead with a deal simply because you ran out of time for due diligence. DO NOT GIVE IN ON THIS!!! Although the financial history of a company is very important and you want to be certain the seller hasn't "cooked the books", a proper due diligence goes far beyond the financial analysis. Many people get trapped looking solely at financials and completely forget about the other key areas to be reviewed. It's a recipe for disaster! If the numbers check out then great but there's a whole lot more that can cause problems later on that must be investigated! If you have never done a due diligence investigation before, or if your experience in this crucial stage of the buying process is limited, then this download is for you. It is without question, the ideal tool to check out any existing business (or franchise resale). You won't miss a thing! This download contains over 50 pages of powerful due diligence strategies, checklists, worksheets, interactive spreadsheets, and step-by-step instructions for each one of the 200 due diligence points that must be investigated. You will receive it via email within minutes, and you don't require any special software or PC configuration whatsoever. Everything is formatted in Word and Excel files. A 200-point due diligence checklist covering every single type of business that you may possibly be pursuing from a one person bakery to a 300-employee manufacturing plant. The 22 key due diligence points you must know in advance of starting the formalized due diligence process. A detailed list of specifically what needs to be examined. A full listing of the due diligence materials required to investigate each and every component of business. Proven techniques to review all of the company's historical financial data. A due diligence assets evaluation formula. Specific due diligence review methods for sales policies, procedures and personnel. How to determine the marketing strategies, failures, successes, options available. You'll know how to establish the viability and long-term prospects of the business and the industry in which it operates. How to interview and evaluate all of the company's employees and see who can help/hurt you. Follow a proven due diligence formula to investigate every single competitor. How to interpret all contracts, leases, agreements in place and evaluate the long term viability of each and any possible liabilities they may present for you in the future. A complete review of both legal and corporate due diligence issues to be sure that you have no exposure whatsoever. Learn how to get competitors and customers to tell you everything that you need to know before you buy the business. How to determine an accurate valuation for the business based upon its strengths, weaknesses, past performance and future possibilities and potential problems. 1. A Pre-Due Diligence Preparation Checklist - Including 22 "must know" instructions for preparing to conduct your investigation. 2. A Required Materials Listing - What the seller must provide before you begin - broken down into each of the eleven due diligence categories that you will be reviewing. It's very important that you have all of these documents in place BEFORE you begin. Sellers usually drag their feet getting you these materials. It's all part of their strategy to limit your time in this process. Don't fall into this trap. 3. Gathering Information on The Industry and The Competition - This 14 page Guide will show you how to get incredible confidential information on these important sectors. You will unveil due diligence issues that the seller will never, ever reveal to you but are fundamental to your decision. 4. The Excel Pro Forma Income Calculator Worksheet - Along with the Guide you’ll receive an Excel spreadsheet containing an interactive Pro Forma Income Statement that you can easily utilize during due diligence for any business. It's already formatted and ready to go. Simply plug in potential sales and expenses and all other related information to verify different future financial scenarios. It will provide you with a Profit/Loss projection. It's in full color and has been especially formatted so you can print out the sheets and have all of your figures on one page (no flipping). You can modify it to suit any business. Its the ideal way to do your Revenue/Expense projections in the "best" and "worst" case environments. (Don't worry if you don't know Excel - it comes with a 10 step tutorial that will have you up and running in minutes!). 5. The Due Diligence Summary Reference Sheets - This report breaks out each of the individual due diligence categories to be investigated and provides a listing of "Need To Know" questions and "Materials Required" for each category. It's a great tool to bring on site with you. There's also a Master Checklist of "Things To Do Before Official Start Date" and a "Key Points To Remember". With this report, there's no need to worry about forgetting to do anything that was outlined in The Complete Due Diligence Guide. A wonderful vehicle for "double checking". 6. 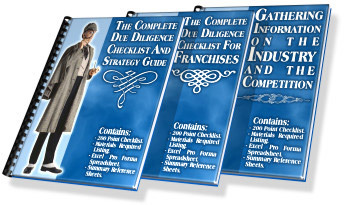 The Complete Due Diligence Checklist and Guide For Franchise Resales - This is the companion guide geared specifically for franchise resales. With this type of business you not only have to do the regular Due Diligence that is covered in The Complete Due Diligence Guide but you also have several franchise specific contract issues and other areas to investigate. It covers it all. If you are looking at a franchise resale this guide is ideal. 7. A Financial Document Checklist - This is a detailed listing of all of the financial documents that you will need from the seller to complete a comprehensive review. It is important that your time clock for the due diligence period does not begin until you have the necessary documents available. 8. The Diomo Business Assessment™ Valuation Spreadsheet - This proprietary formula will allow you to analyze and score all of the businesses components including the: products/services, sales, contracts, employee replacement issues, customer vulnerabilities, inventory review, deal terms, historical financial data, competition, future and apply an accurate valuation to the business. No questions asked! This is not a 30, 60 or 90 day guarantee; you can get a full refund ANYTIME. The download contains all Word and Excel formatted documents so you do not need any special software. Regardless of your connection, download time is under one minute. The download instructions will appear on your screen immediately after you place your order. You will also receive an email with the download link for your records.